Estroven® 92961019474 New and Improved Estroven Maximum Strength plus Energy is a safe and effective dietary supplement made with a strong, triple-action formula that provides maximum relief from multiple menopause symptoms. * New and Improved formula combining twice as much Black Cohosh as other leading brands with clinically proven Soy Isoflavones gives you maximum relief for hot flashes and night sweats. * Plus, it helps to manage irritability and fatigue so you can feel like yourself again. * For best results, daily use for a minimum of 60 days is important. Estroven Maximum Strength + Energy is rated 4.6 out of 5 by 750. Rated 5 out of 5 by Anonymous from Thank Goodnes, Finally refief I started taking this a few weeks ago and already feel it is working tremendously with my hot flashes during the day and at night. I was waking up at night feeling like I had a fever but was just good ole night sweats. Thank Goodness I am finally getting the relief I need. Rated 5 out of 5 by mareea27 from Great features! They really help me.I'am sleeping better at night now, it reduce my night sweats and swing mood since i started takeing them only a week ago.first time i sleep better in a a few years and iam myself again. It recommend it be taken for 60 days and i will be getting some more Great product! I will recommend this product to any one i know. Rated 5 out of 5 by Emeraldkitty from Awesome I had been having night sweating and hot flashes. I wanted to try this product to see if it helped since it is available without a prescription. I have to say I am very impressed with this product. It's all natural and it works. I am no longer having trouble sleeping, tossing and turning, hot then cold. It also seemed to help my mood a little. I would definitely recommend this product to anyone having issues such as hot flashes a d night sweats. Rated 4 out of 5 by Stace7475 from Great Symptom releif I have recently developed hot flashes. This product has been helpful for decreasing those and increasing my energy level. I ahven't had many night sweats but a few and since starting this product I haven't had any. Rated 2 out of 5 by Vanismom from Sounds great! I received this through bazaar voice sampling. I am at menopausal age and am starting to do through it. I'm not exactly sure if these work because I feel no different. I probably was wishing that these would make me feel less irratable and emotional but fact is I feel nothing different while taking these. Rated 5 out of 5 by jujubeans142003 from Love it I tried it and I love it. It really helps with all.of my symptoms and helps me have more energy to get through the day to do the things that I need to do. I will be purchasing this product and recommending it to everyone I know. Rated 5 out of 5 by audra52 from WHY WHY WHY!!! Why haven't I tried this 2years ago? I Love Love this. Hot flashes, mood swings, have all decreased. My energy is finally back. I was nervous at first. I was taking I-cool for about 7months and some people said that I should try this and cut down on my sugar as well. OK, so now I doing both. I wake up now knowing that I will now get relief and I don't have to suffer. I still get hot flashes, but not every darn hour any more. AWESOME!! Rated 5 out of 5 by Aging gracefully from A miracle ! I am 44 and begin having hot flashes about 8 months ago, feeling tired all of the time and not feeling myself. I felt like I had brain fog and major issues with focusing at work and home. I discussed my symptoms with my Mom and friends and begin feeling embarrassed about beginning the change. I begin researching hormone replacement and didn’t like what I was reading about the side effects. I came across estrogen and saw it at Sams club and thought about giving anything a try. Omg within the first week the hit flashes diminished, I have been able to focus and my family can definitely tell the difference. I am so happy I found this product and option and I am going to purchase another box today because I can truly feel the difference. I do not want to run out and I am definitely backing estrogen and sharing with my family and friends that mention they are starting to get hot flashes or feel the same symptoms. Thank God for estroven ! Estroven® Maximum Strength + Energy contains approximately 52 mg of naturally occurring caffeine per serving (similar to a cup of tea). 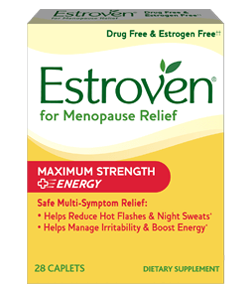 Estroven® Maximum Strength + Energy does not contain synthetic estrogen, preservatives, yeast, wheat, gluten or lactose. Please click on the questions below to display answers. 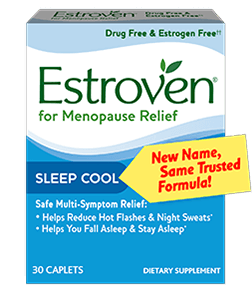 How does Estroven® Max Strength + Energy reduce hot flashes and night sweats? How does Estroven® Max Strength + Energy help manage irritability and fatigue? Does Estroven® Max Strength + Energy contain caffeine? Yes, it contains 52mg of naturally occurring caffeine (similar to an 8 oz cup of black tea). Does Estroven® Max Strength + Energy contain soy? Yes, Estroven® Max Strength + Energy contains soy. Soy Isoflavones have been clinically proven to reduce hot flashes and night sweats*. 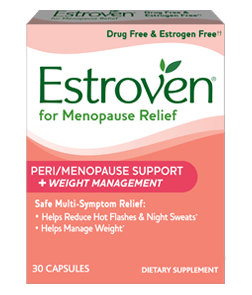 Does Estroven® Max Strength + Energy contain the hormone estrogen? No. 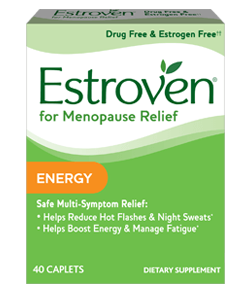 Estroven® Max Strength + Energy does not contain synthetic, animal or human-derived hormones. 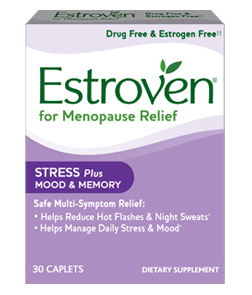 How long should I take Estroven® Max Strength + Energy before I start to see relief for my menopause symptoms? Results vary based on each individual’s symptoms and needs, however we recommend daily use for a minimum of 60 days for best results. Can I take more than the recommended serving of Estroven® Max Strength + Energy? No, Estroven® Max Strength + Energy should be taken as directed. It has been formulated with amounts of the active dietary ingredients to achieve the desired results. 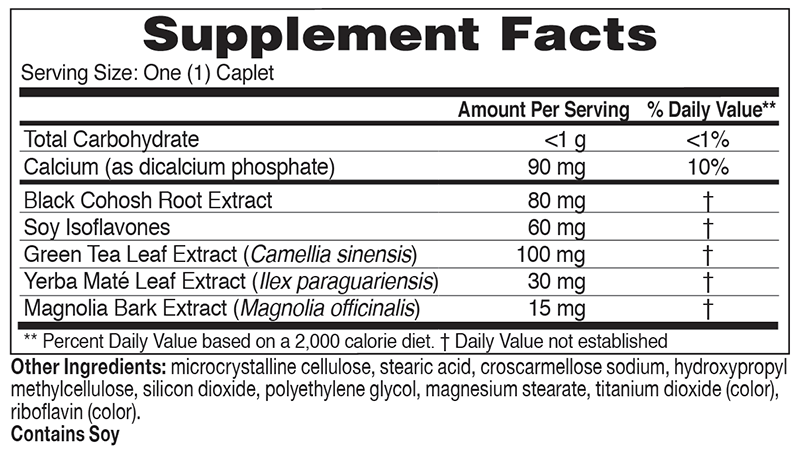 Can I use Estroven® Max Strength + Energy with other dietary supplements or medications? We recommend speaking with your health care professional to see if taking Estroven® Max Strength + Energy with other dietary supplements or medications is appropriate for your individual situation. How should I store Estroven® Max Strength + Energy? Please store Estroven® Max Strength + Energy at room temperature. Do not expose to excessive heat, humidity or direct sunlight. Take one (1) caplet per day. For best results, daily use for a minimum of 60 days is important. As with any dietary supplement, please inform your health care professional before taking. Do not take if pregnant, breastfeeding, or intending to become pregnant. Keep out of reach of children.